This is our first guiding principle. In reality, a farmer gains access to seed from different seed systems, e.g. he/she will save his/her own seed of sorghum, buy/exchange bean seed from a local seed business/provider, maize seed from a national seed company, and onion seed from an international seed company. Each seed system has its own values and limitations and requires a unique approach in strengthening it. ISSD targets interventions in specific seed systems. 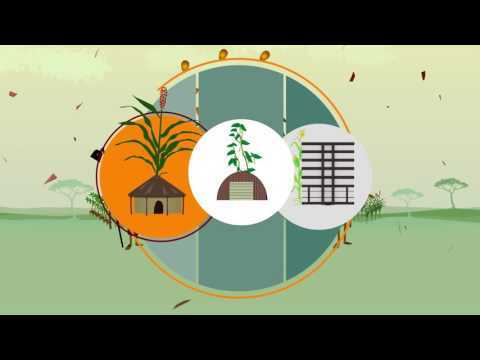 A seed value chain covers the process of activities from management of plant genetic resources, variety development, early generation seed production, and seed multiplication to seed distribution and marketing. We map the operators, service providers and the institutions of the enabling environment in a seed chain, which differs among crops and specific chains, but most significantly between different seed systems. The objective is to design strategies to enhance the efficiency of the seed value chain. The importance of farmers as seed users and drivers of the chain is emphasized. The value chain approach is linked to this next guiding principle. Entrepreneurship for us means making a business out of seed production and distribution and/or related seed services. Why entrepreneurship? Well, because by its definition it is market oriented and an important incentive for sustainable development. Entrepreneurship and market-orientation can be promoted in both formal and informal seed systems, for private as well as public actors in the seed value chain. Despite all past public and private efforts in seed sector development, informal seed systems continue to dominate in most developing countries, supplying more than 80% of the total seed used by farmers. Farmers rely on the farmer-saved seed system, in which seed production is integrated in crop production, for many locally important crops since seed is simply not available through other sources. Informal seed systems are key for smallholder farmers in relation to food security and promoting resilience in the face of increasing uncertainty. This is what we try to accomplish in ISSD. Farmers and formal sector professionals may be linked in various ways through different components of the seed chain. For example in genetic resources management the systems may be linked through supporting Community Biodiversity Management. In variety development, professional breeders and farmers may interact through Participatory Variety Selection. In seed production, farmers’ seed management practices may be strengthened through seed extension and linkage to formal research and seed technology development centers. In seed dissemination, informal and formal systems may be linked through the establishment of local seed outlets in farmer communities. Different stakeholders in the sector have different objectives and interests in seed sector development, but also complementary roles to play. This also counts for the public and private sector. At a superficial level, two predominant forces can be generalized, namely development-led and market-led seed value chain operation. Following a development agenda on seed and food security, the public sector strongly focuses on the production of quality seed of improved varieties for the main food crops. The private sector strives for efficiency and effectiveness in product development for maximizing profit, and thus has a generally good understanding of what the market demands. It is Government’s role to create an enabling environment for quality seed production by combining food security and economic development objectives. With ISSD we aim to make seed policies more coherent with the practices and realities of farmers and advocate for enabling and evolving policies that support a dynamic sector. Policy frameworks should support the strengthening of multiple seed systems and not strive single-mindedly for an evolution towards one general presupposed norm or ideal. Appreciating the dynamics of the agricultural sector, these policies need to be able to accommodate changing circumstances. Last but not least, through the ISSD approach we promote evidence based seed sector innovation as a guiding principle. We support research and studies providing evidence for the design and implementation of seed sector interventions. Furthermore, we facilitate stakeholder partnerships to jointly experiment with innovative approaches towards solving key seed sector bottlenecks. Accordingly, knowledge institutes are natural partners in ISSD.